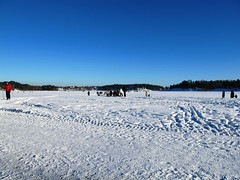 Look at the row of people in the middle walking on the ice of Oslo Fjord. 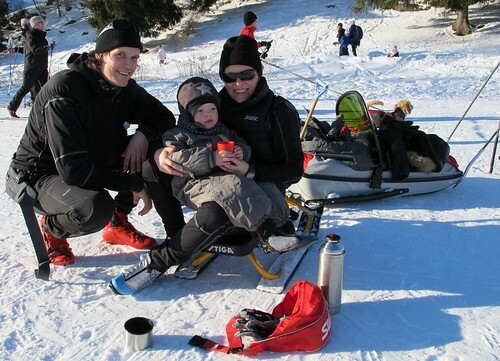 Family ski fun on a hill in our local neighbourhood. 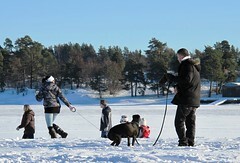 Although this has been an especially cold winter many places with lots and lots of snow, it is important to remember that snow means more than delays in reaching your destination on the highways, snow and winter also mean exercise, fun, fresh air, childish memories, and even water reserves for the summer season. Today was just a wonderful day to be outside, and I am happy to have the opportunity to share it with you. However those coming to the Oslo Blog Gathering 2010 – I can almost promise you that you will not have to worry about ice and snow, unless you are visiting the Ice Bar of course! 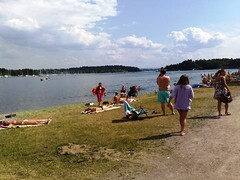 I have added some summer beach pictures so you can get more of an idea of what to expect in the lovely summer time! I don’t like snow so I’m going to Hawaii instead. Enjoy the snow and the freezing cold. To each their own. You have a lot more snow that we do! Looks like a fun day enjoying the great outdoors. Enjoy your new week, Renny. Oh I just love the comparison photos! And the sunshine! WE did have some sun yesterday but I forgot to bring my camera! We have probably had the mildest winter since I have arrived in Canada. Maybe some Norwegians would have only t-shirts on at about 8C out! Yes it’s warm for this time of year and no snow! Oh,I really thought you had a swimming event on a -5C day?haha!well,a perfect day for family bonding and for skiing or outdoor fun as well! I think i shud keep some pictures in the same angles but in diff season,such interesting to compare!good idea,Renny! im sure Diane had a good time,too! Lovely snow and shiny sun, as in a postcard! I never could imagine a snowy beach! 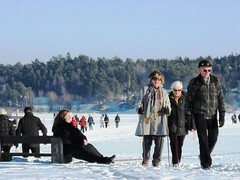 Wow, the summer and winter pics of the same area of the beach are marvelous! 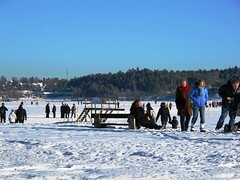 I am so happy to see all these snowy pictures of Oslo. I feel like I am there even if I am here in sunny Dubai :) Nice pics Renny! Regards to Diane!! Yes Renny, ir was a beautiful sunnu Sunday. Lot’s of people out in the fresh air. It was a Day that really lightened up, like your wonderful photos. I remember Oslo in August. The light was fantastic clean atmosphere, delicious food, wonderful people, I fell in love with Norway for ever. My husband has accepted. 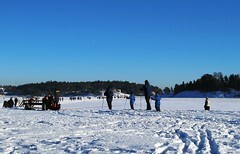 My son started to take their first steps in Holmenkollen. What to say about Norway! Spain is my home. Norway my passion. 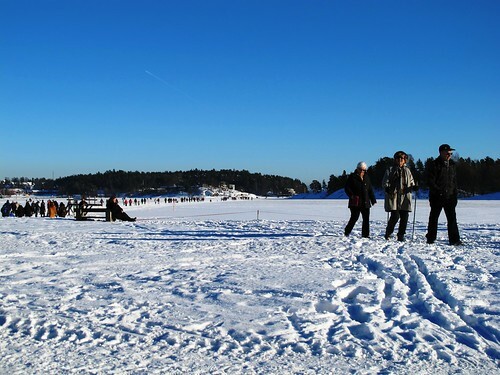 Being outside under such wonderful blue skies, with sun and snow – nothing can beat that magical feeling! Umm…yummy snow fun! I miss it sometimes! Great side by side photos. What a cool idea,posting the beach in the summer and then how it looks now.Both seasons absolutely look awesome.I’m hoping and praying I can be a part of 2010 Oslo….my sister would freak if this could really happen for us. Great pictures!! Texas hasn’t seen snow like that since I “think” it was 1984 or 85’…somewhere around that time.Since we never get snow, that actually sticks….nobody can drive in it.Ya’ll are used to it.It’s chaos and the Emergency rooms are full when it even gets a tad bit icey on the roads here. Thanks for giving us a look at your side of the world!! Btw,do you have any idea how I can get rid of that little picture of me in the top left corner?lol Or maybe change it? You need to log in to http://www.gravatar.com/ and update you’re profile. Seriously now, your country is beautiful both in Summer and Winter; however I am glad I will not experience any snow in August there ;). Keep on sharing the wonders of Norway! You have posted some very scenic pics. The sky so blue with all the snow around makes for quite a landscape. It really shows that norwegians know how to have fun regardless of the weather ! Picnic in winter! Oh, that is so cool! Would love to try tha in Norway. It’s presently too hot for picnics in Singapore.